Ah Paris, Je t’aime with your perfect accent, beautiful people, plentitude of museums, and delicious, absolutely delicious, food. This year I was fortunate enough to travel to Paris and catch up with a very good friend of mine. 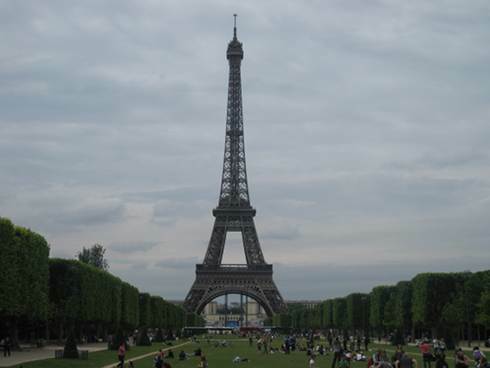 With this trip, I had a rare insight into the Parisian life: what they like, where they frequent, what they eat and why. I guess you can say this was my foodie retreat. One of my goals while on this trip was to experience Parisian brunch and breakfast. As I have been told before, brunch is not native to the Parisian menu. In fact, it’s more of an import that some restos decided to add to the menu. 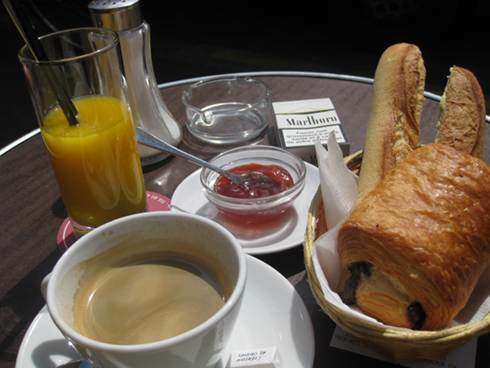 Traditionally, the morning meal is the petit dejeuner which is a very light dish comprised of a croissant or chocolatine, a coffee, a little bread and some jam (cigarettes on a terrace are optional). 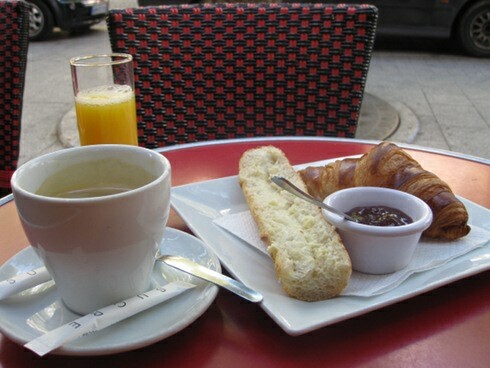 So, during the my time there, I made it a point to start my day with a petit dejeuner. I went to various spots throughout the city and found that on average for around 8 Euros or around $10 Canadian, you could get a coffee (either espresso or Americano), along with a glass of orange juice, a choice of pastry such as a croissant or chocolatine, bread and jam. It’s small, under $10 and is all you need to start your day. Some places will offer a larger petit dejeuner and add an omelette to it if you need something more filling. I ended up having the larger breakfast opting my 1st day when I arrived at the Paris Nord train station absolutely famished. I looked for a place with a petit dejeuner and a terrace in a quiet section and for around 12 Euros or $15 Canadian I got a petit dejeuner with an omelette on the side. 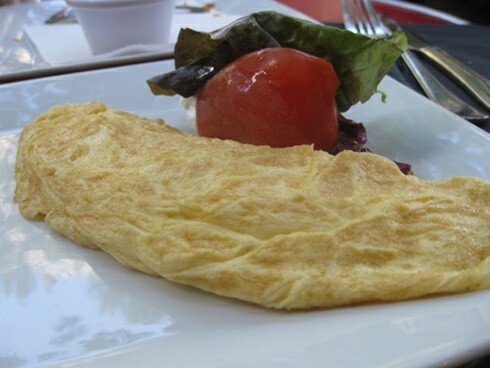 The omelette was simple and tasty and it came quickly as did my main breakfast. I would later modify my behaviour to having a smaller breakfast since it was not really needed on account of eating dinner really late and not waking up famished. 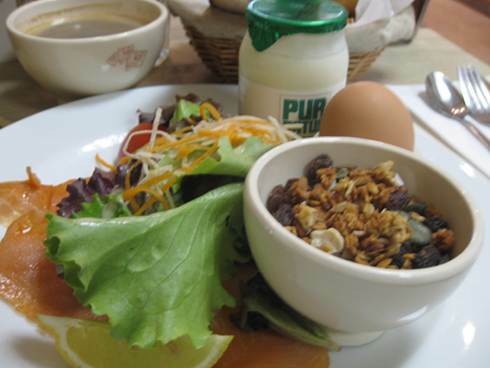 What makes the Petit Dejeuner so enjoyable is that its simple, tasty, and relatively inexpensive. There is no desire to have an enormous heaving plate of eggs and meat especially when a simple croissant is so fresh and delicious. I mean, it’s not that the croissants are better than any croissants back home, but it’s more the fact you will not find a bad one. In every spot I went to the croissants were good or excellent. These people love their fresh croissant and you can taste it. The coffee, as well, is something so Parisian. Wherever you walk, people are relaxing on a terrace having a coffee. You don’t see people running to grab a coffee and then bolting out and downing it while on the way to a meeting. They enjoy their coffee and why not, it’s good and the weather is amazing. Now that we have covered the petit dejeuner lets take a closer look at Brunch. Right off the bat, if it’s Saturday and you are looking for Brunch, good luck. I found that out the hard way. I’m sure there are some spots that exist but I could not find them and odds are they are somewhere far so that kind of defeats the purpose. On a non Saturday, there are two brunch spots. One is called Rose bakery which is quite popular with locals and every person I met suggested I tried it and the other is a brunch at le Pain Quotidien, a bakery near where I was staying and my default baguette supplier while in Paris. Rose bakery has 3 locations. We decided to go to the one in le Marais, a district in Paris. Rose bakery has British roots with the founders having setup shop in Paris and become local favourites in very little time. The place is tiny and there is focus on fresh organic produce. Items can disappear from the menu if you get there late and you may have to wait in line a little. Once you walk in you have to navigate cases of vegetables, a cash and order counter on your right then someone will seat you. The main dinning area seat less than 50 people the décor inside is nothing too fancy and has that laid back feel. The menu has a mix of items under 10 Euros ($12), a few floating in the 14 Euro zone ($17) and one or two items at 17 Euros ($21). In regards to prices, do keep in mind that a petit dejeuner is at around 8 Euros and some Brunch specials I have seen in other spots are in the 20 Euro plus zone. The menu is a one-page sheet that can change from time to time which always makes things interesting. On the menu you will find items like: granola, soft boiled eggs, pancakes , eggs bacon mushroom and tomato dishes, soup, vegetable dishes, scrambled eggs and smoked salmon, cheese muffins and eggs, hamburger eggs and chips (the british kind) , eggs Benedict, scones, scrambled eggs, scrambled eggs and crab. Our order started with scones and jam. The scones were warm and tasty and they were better than most scones I have had although were not the best granted my friend who had been there before told me that the scones were off that day. Some dishes were not available because they were out so we went with scrambled eggs and salmon as well as scrambled eggs and crab. 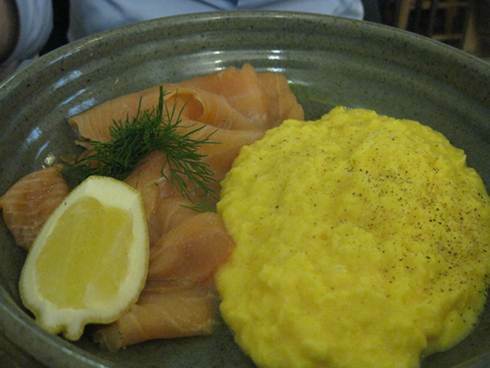 The salmon and scrambled eggs dish had some thickly sliced salmon which was fresh and delicious. Every bite was impressive and made you crave more and the scrambled eggs were an excellent accompaniment. One would not assume that scrambled eggs would be a good partner to smoked salmon but this is a winning tag team. If the salmon and scrambled eggs was good the crab and scrambled eggs was even better if one can imagine that. Basically, its shredded crab on top of scrambled eggs but this simple pairing had an out of this world taste. 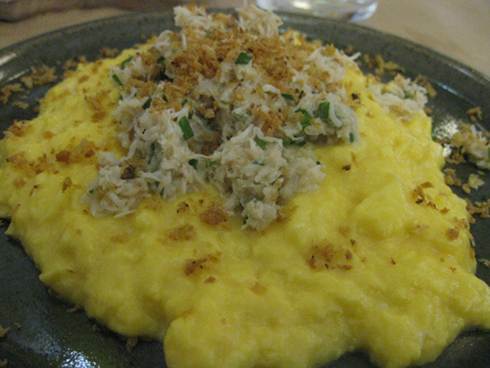 The crab was unbelievable and the scrambled eggs were the perfect base for the crab. The scrambled eggs were not too liquid not too dry, just the right amount of awesome. For the last place, I stumbled on it on my last day. I had to leave early to get my flight and no places were going to be open so as I was giving up on my search until I passed by the local bakery I would get bread at and saw a sign for brunch. So with the heavens offering me brunch on my last day, I entered le Pain Quotidien and took a peak at the menu. The menu had two main brunch options, one was the Brunch Paysan at 22.95 ($28) Euros and the other was the Brunch Royal at 25.95 Euros ($32). The Brunch Paysan consist of cold cuts, soft boiled eggs, yogourt and granola, selection of breads, croissant or chocolatine, apple juice, coffee of tea, and jams. The Brunch Royal is similar although a few fancier items. You get smoked salmon, soft boiled egg, yogourt and granola, bread selection, apple juice, choice of coffee or tea, and jams. Basically it’s the same as the Paysan except you get smoked salmon. The dish itself was nice and had lots of side dishes making it looking quite impressive and kind of Royal as the name implies. The salmon was good, the slices were generous and the yogourt and granola was healthy and delicious. The croissant and breads, as always, were excellent and the beverage selection was ample. By the end of it I was full but almost 26 Euros poorer. Let’s keep in mind that’s around $32 Canadian. Simply put, the price was too much for what I got. If you think of it, that can be what you pay for dinner at some spots. So as I look back, I realized I love the terraces, the petit dejeuner as a nice small bite in the morning. I loved Rose Bakery with it’s healthy and unique approach but Brunch is pricey overall. It seems almost like an import from North America that allows restaurants to charge more and another seating on the weekend to increase revenue. Now, don’t get me wrong, I enjoyed every bite but $32 can go a long way and it did not go far enough for brunch.